The top frame contains links to items about the club itself. It can be resized out of the way, if required. The frame on the left is a diary of concerts in this, our forty-first, season. It can also be resized. The names are links to details about each event. We want to hear from you! If you've found your way to this site by design, and are interested in the club please email us. If you wish it, we will email you whenever the site is updated. The Regis Music and Concert Club was formed in 1977 to promote the performance of vocal and instrumental chamber music for members and visitors. The inaugural concert was held on 22nd January 1978. The name was changed twenty-two years later to Bognor Regis Music Club. 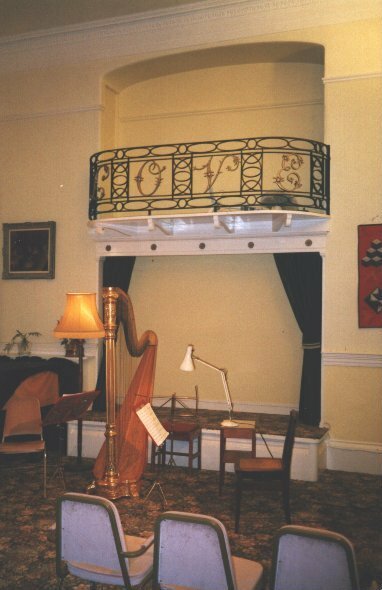 Recitals are held in Regency-style premises, boasting a minstrels' gallery, (right) and ideally suited for the performance of small-scale works. The Concert Room is particularly popular with chamber groups because of the high ceiling and friendly proportions. It was used extensively for concerts until 1883, when it also served as the Town Council Chamber. The concert room is on the first floor, approached by shallow stairs with handrails on either side. A stairlift allows access for the disabled. Established musicians are engaged to provide recitals of high musical standard and varied content. Further details from the Club Secretary. Note that recordings of professional concerts are not permitted. These informal evenings provide an opportunity for members to perform at the club. In order to take part, ring the organiser at least two weeks before the evening. A list is maintained of members interested in performing; if you wish to be added to the list, please contact Helen Woods.